Alexander Fleming was a Scottish biologist, pharmacologist and botanist. 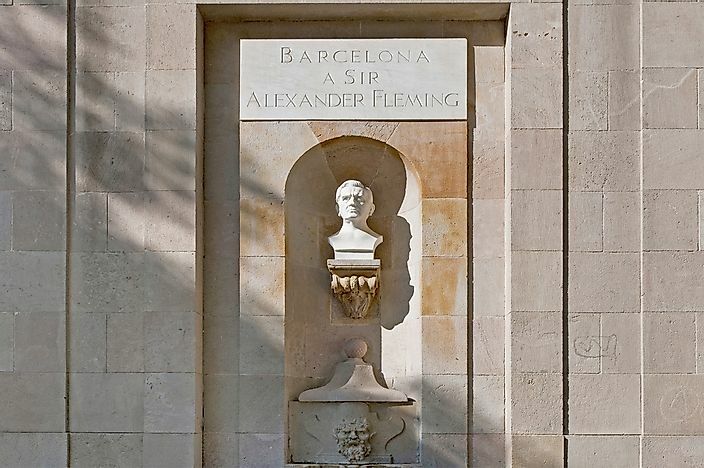 A monument to Alexander Fleming located in Barcelona, Spain. Alexander Fleming was a Scottish botanist, biologist, and pharmacologist. Fleming was famed for being the pioneer in the production of an antibiotic after he discovered the world-famous penicillin in 1928. Fleming became renowned in the field of bacteriology after the discovery of penicillin led to him receiving the Nobel Prize in Physiology/Medicine along with Ernst Boris Chan and Howard Florey in 1945. Alexander Fleming was born on August 6th, 1881 at a farm near Darvel, a small town in Ayrshire, Scotland. Fleming was born to Hugh Fleming, a farmer, and his second wife, Grace Stirling Morton and was the third born of four children. Alexander Fleming attended the local Darvel School and the Loudoun Moor School in his childhood and later studied at the Kilmarnock Academy after receiving a two-year scholarship. In his late teen years, Fleming worked in a shipping office until he inherited some cash from his uncle, John Fleming in 1901. Using the inheritance, he enrolled at the St Mary’s Hospital Medical School in 1903 where he later received an MBBS degree in 1906. After receiving his degree, Alexander worked in the school’s research department under Sir Almroth Wright and was his assistant bacteriologist. While at St. Mary’s School, Alexander Fleming gained a Bachelor of Science degree in Bacteriology and soon after that became a lecturer at the institution. During the First World War, Alexander was enlisted as a Royal Army Medical Corps captain and worked in several battlefield hospitals in France. During his time in the war, Alexander witnessed sepsis killing many soldiers despite the use of antiseptic when treating wounds and began his research on this cause of infection and later submitted his findings to “The Lancet,” a medical journal. After the war had ended, Alexander went back to St Mary’s Hospital and in 1928 became the Professor of Bacteriology at the University of London. After returning to St. Mary’s Hospital after the First World War, Alexander continued to conduct his research on the cause of deep tissue infection despite the use of antiseptic and focused his research on looking for alternative antibacterial substances. While doing his research, Alexander discovered an enzyme known as lysozyme (present in nasal mucus of a patient) inhibited the growth of bacteria. However, Fleming later discovered that the enzyme did not have the potential to be administered in wounds as it had little effect on the bacteria. On September 1928, Alexander discovered a fungus in his laboratory which effectively killed a wide range of disease-causing bacteria. The fungus was of the Penicillium genus, and after several tests, Alexander released an extraction from the fungus and named it “penicillin.” The discovery of penicillin is said to mark the start of modern antibiotics with penicillin saving millions of lives all over the world. After Alexander Fleming had made his remarkable discovery, he published it in the Journal of Experimental Pathology. However, little attention was paid to his discovery and meant that Fleming received no support to conduct further research on penicillin. Despite the lack support, Fleming continued conducting his research in his laboratory, but after suffering few setbacks, he abandoned his research.